It was eerie being at the places which have been burnt into our memories from the non-stop television coverage a few months back. We were in Mumbai for a visit to the Consulate of France for our visas (we expect to be in Paris for our next family vacation in April). It took me less than three hours to reach the Taj Palace hotel. We had started early to avoid the office traffic in Mumbai; now we had a few hours to kill before our appointment. 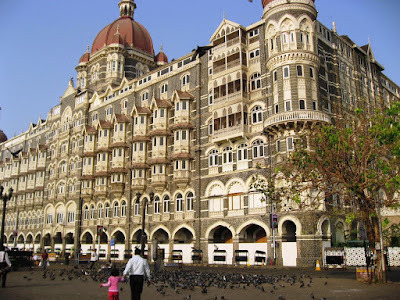 We strolled around the Taj Palace remembering the events of that fateful day. The sea was filled with small boats and the rising sun reflected off its grey waters. 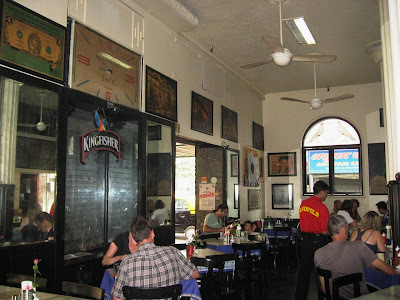 As we hunted for a place to have breakfast, we chanced upon Leopold Cafe in the lane behind the Taj. The restaurant had already opened and there were a number of foreign tourists lazily eating breakfast. We seated ourselves close to the bar and ordered masala omelettes, buttered toast and cappuccino while our daughter decided to try the cheese and chicken sandwich. This cafe has existed since 1871 and it certainly looks its age. 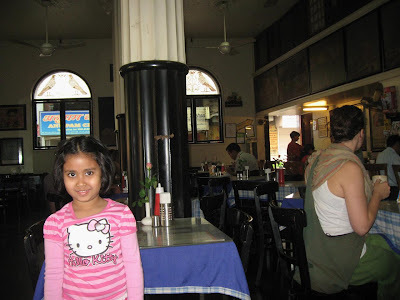 Among the more popular Irani cafes in Mumbai, the recent notoriety has brought in more visitors. From our table we couldn't see signs of the violence that had killed at least eight on that fateful evening, but when my eyes strayed below, I noticed we were sitting right at the table where a grenade had exploded making a fist-sized hole in the granite floor. The breakfast did us good, and I ordered a second cup of cappuccino before leaving. 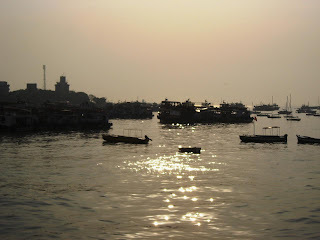 We then moved to Nariman Point, close to where the French Consulate is located. It felt wonderful - and unreal- to be sitting on the sea-side at Marine Drive on a Monday morning, lazily reading a newspaper and spending time with the family. The sea sloshed against the strange-shaped concrete wave breakers sprinkled along the coastline. 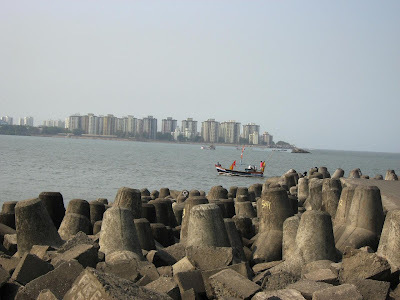 Nariman Point, among the world's most expensive business districts, was reclaimed from the sea in the late 60s. Those unusually shaped concrete wave-breakers turns out to be a South African innovation. When solid walls couldn't resist the fury of the seas, these breakers, being more porous, helped dissipate their energy quickly. They were initially called Dolosse, a name given to crude toys made of bone (and used by witch-doctors for rituals). These toys were made of knukle-bones of goats and sheep and shaped like the letter H but with one leg turned away 90 degrees. Finally the time arrived and we walked into Hoechst House for our visa appointment. The experience was very positive. They called us the minute of our appointment, and the formalities (which included fingerprints and photo) only took five minutes. Another ten minutes and we had our passports with visas on them. They even included detailed brochures with a CD and maps. I was very impressed! For our vacation in Paris, I have booked us an apartment very close to the Louvre in the very heart of Paris (here's a link you want to peek). We want to let time move slowly there, so we haven't planned too many activities ahead of time. Right now, we expect to do a wine tour, maybe take a train journey to the South of France, and even a short trip to Barcelona. Watch this space! Good place to have breakfast in this place that's even more famous now! And Happy vacationing! Oh, we may be in France at the same time: I'll be there from April 2nd to April 22nd. Let me know! I need to go to Bombay as a tourist. I have just seen the Powai bit when I visited IIT Bombay. Leopold is a place I have heard so much about, and the attack in November has just made it even more important to visit the place soon! I had the pleasure of being at Leopolds on New years and then sitting across at Nariman Point at midnight to welcome 2009.Although Leopolds was very crowded at that time with the news cameras rolling and news casters standing right next to our table! Taj Hotel was cordoned off completely for about a kilometer and people had to walk down instead of traveling in their swanky Mercedes cars. Things might never be the same for the people ever again who witnessed the saddening events for 26/11 but to be frank,a lot can be earned in the form of tourist destinations from it. @Zhu: Cool! I am looking forward to our trip...our first to Paris. @Tanuj: I can imagine. Especially since the event was only a month old then. always liked Leos and spent quite some time at the taj..
have a great trip..will be watching this space.. Sounds like a wonderful adventure - and its always great to read your personal experience. Woooow: brochures with a CD and maps - that's modern tourism! Wow, Paris! City of Lights, Romance...etc! Have a great trip. @Shalini, @indicaspecies: Thank you, we are looking forward to the trip! Lucky you. Paris in April sounds like an awesome vacation. Have a great time. @Vamsee: Thank you! Yes, we are looking forward to it. I suppose you're having a great time in Paris now. It's amazing that you're able to travel for so many times in a year! @kyh: Lucky me! I will be in Paris starting this Friday. Yes, the Taj is back in business (but the heritage section is still being repaired).